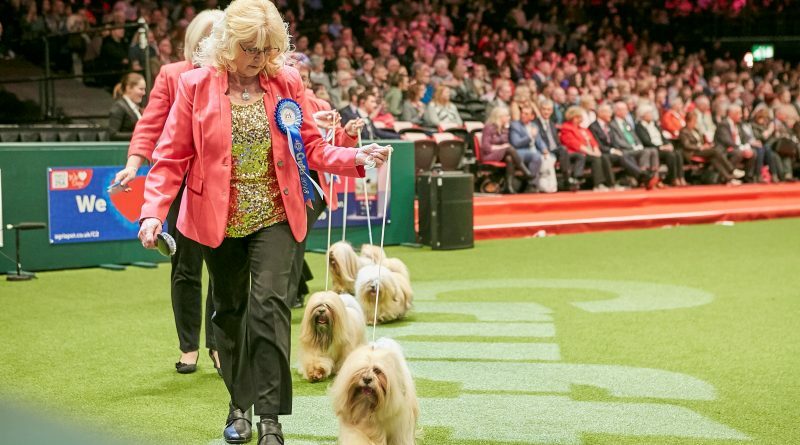 A dog breeder from Coventry, West Midlands has won the Kennel Club Breeders’ Competition at Crufts, the world’s greatest dog show. Margaret Anderson, whose team comprised Zentarr Brockman handled by Margaret, Champion Zentarr George handled by Leah Scales, Zentarr Matthew handled by Beverley Manners and Croatian Champion Zentarr Tobias handled by Belinda Yaxley, won the ultimate breeder’s title with their team of Lhasa Apsos in front of a packed Genting Arena at the NEC, Birmingham yesterday, Friday 9th March. The team beat 31 other breeders to win the competition, which saw 116 dogs in the main ring at one time. Judge Ronnie Irving selected Margaret’s team of Lhasa Apsos for the prize as the breeder with the best overall quality evident in their dogs. Margaret will be familiar to dog lovers, as her Champion Zentarr Elizabeth was crowned as Crufts Best in Show winner in 2012. All four dogs in this year’s Crufts team are descended from the famous Elizabeth – her son, grandson and two great grandsons, all bred under Margaret’s Zentarr kennel name. Reserve best breeder was awarded to Ruth Gee from Worksop, Nottinghamshire with her team of Norfolk Terriers which she breeds under the Watercroft kennel name. The competition, sponsored by Agria Pet Insurance, made a welcome comeback at the show last year as a stand-alone competition. Each team comprised three or four dogs of one breed, all bred by the same breeder or breeding partnership.